MUGS & STEINS SERIES!Ideal for Indoor & Outdoor Events! 14 oz. 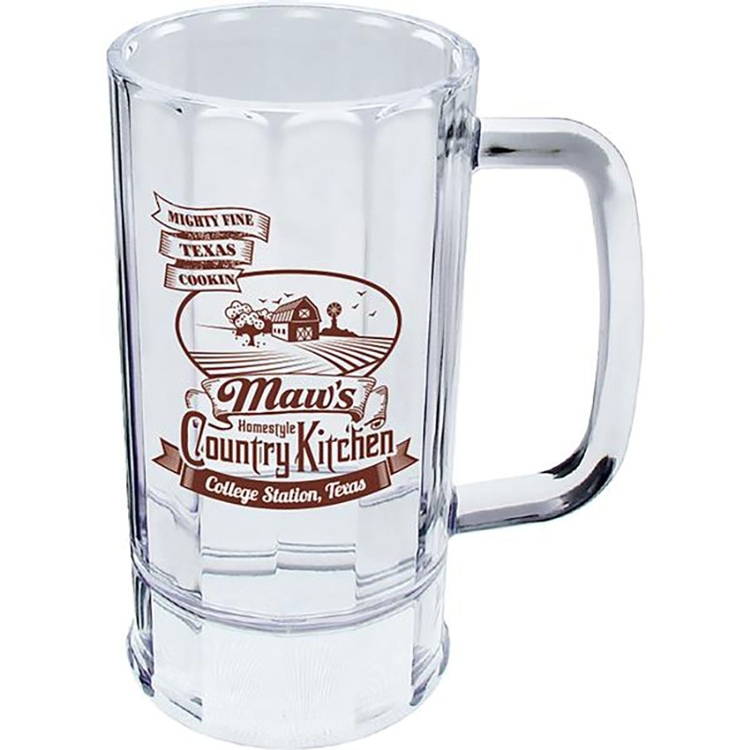 Traditional Root Beer Mug with Handle and thick fluted base, Made in USA of heavy Clear Styrene Plastic. Perfect for indoor or outdoor use. Prices include a one color, one location imprint with options of additional spot color printing and full color process printing available. Recyclable, BPA free, top rack dishwasher safe and FDA approved. This product can be molded in any color with a 5,000 piece minimum order. Many other sizes & styles of Mugs & Steins available. SILKSCREEN IMPRINT: Price includes a one-color imprint on one side in a 2.25”w x 3”h area. See “Options” above for standard imprint colors, PMS color match, additional imprint color charges and 2nd side imprinting charges.